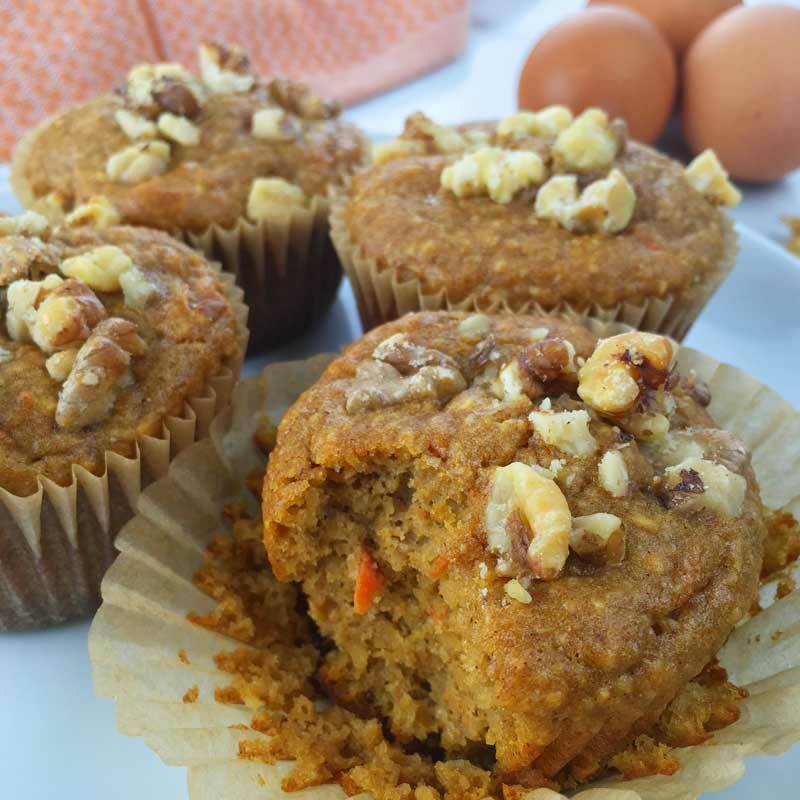 These gluten-free, paleo, protein-packed carrot cake muffins are the perfect grab-and-go breakfast or quick-and-easy snack for staying healthy “on the go”. Finding meals and snacks that are delicious is easy…but finding meals that are delicious AND healthy AND filling AND gluten-free AND refined sugar-free AND paleo? Nearly impossible. Y’all, it’s no secret that my favorite dessert is carrot cake. And not just any carrot cake, but my mom’s carrot cake with cream cheese frosting. But let’s be honest…if I made/ate carrot cake as often as I crave it? I’d have serious health issues! So I was thrilled when I came across a gluten-free muffin recipe that had a solid base for flavor adapting. It was when I had one of those “cravings” that I figured I’d try adapting the recipe to be more “carrot cake like”. 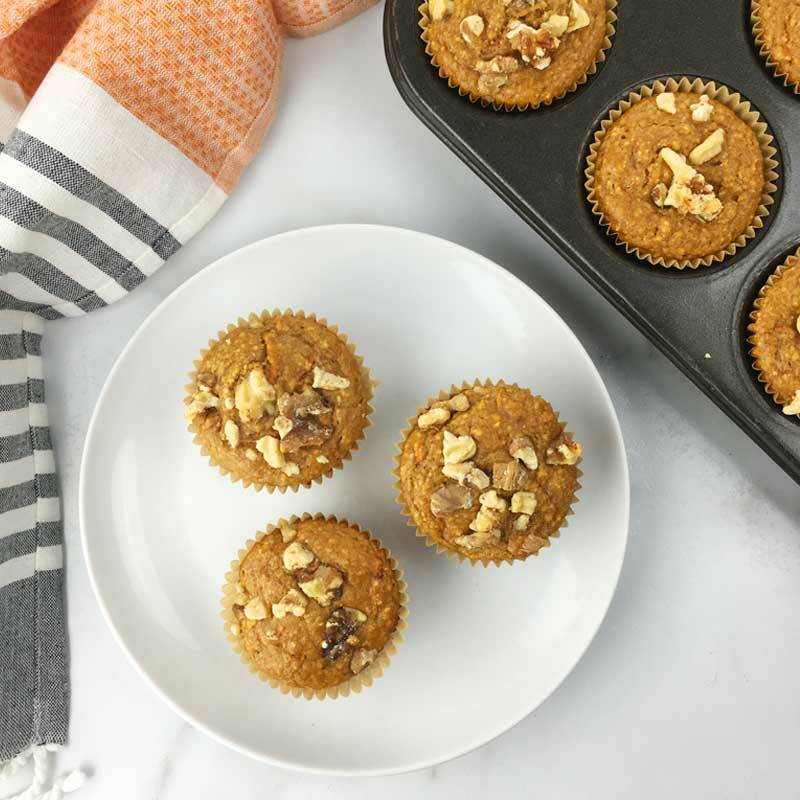 These carrot cake muffins are not only healthy, but they’re incredibly delicious and you’d hardly know they were healthy (except, of course, that you baked them yourself!). Good ol’ almond flour. Surely if you’ve done any amount of gluten-free or paleo baking, you’re no stranger to almond flour. Not a suitable 1:1 substitution for gluten-free baking, but perfectly measured for this recipe. It’s true that almond flour is high in protein and healthy fats, and can be a fantastic alternative for standard flours. But do use caution, it’s quite a bit higher in fat and, if not eaten in moderation can lead to a bit of gut trouble due to the phytic acid in the almonds. Some die-hard paleo dieters don’t consider almond flour part of a healthy paleo diet, but when consumed in moderation, I think it’s a great gluten-free alternative. Protein or collagen powder can be a great addition to a healthy diet. Although not always necessary (and sometimes cost prohibitive) it’s ALWAYS important to source your protein carefully. Protein powder is not part of our daily routine, but collagen is! We view protein powder as a “supplement”, so we only use it when we can’t get adequate protein otherwise. Because these muffins are great as a quick on-the-go meal, the protein/collagen is an awesome addition since it helps keep you full. Plus, have you read all the benefits of collagen??? We’ve tried many protein powders in the past, but always feel it’s important to source a high-quality, grass-fed non-denatured (and biologically active) whey protein. That it be made from hormone-free, raw milk and also be free of chemicals or pesticides. If it doesn’t pass these rigorous tests, it’s not going in my mouth! Beyond that, a high quality protein powder sourced from grass-fed cows can help stabilize blood sugar, improve immune system function, curb appetite, lower cholesterol, repair muscle tissue, detoxify the body, increase energy levels and is a perfect and complete protein. If you’re not into the whole protein powder game…simply swap it out with vanilla collagen peptides instead. As with all baked goods, you need to have some leavening. And with a gluten-free recipe, this is even more important. Gluten free baked goods often go hand in hand with “dense”…and that’s not always a good thing. To keep these muffins light and fluffy, we use baking powder. You could use baking soda, if you’re out of powder…but the beauty of baking powder is the “double-acting” action. Baking powder is made up of three ingredients. The first, sodium bicarbonate (baking soda),will give instant rise once the dry baking powder is mixed with the wet ingredients of the batter (assuming there’s an acidic medium like yogurt, vinegar or buttermilk). But the remaining two ingredients (sodium acid pyrophosphate and sodium aluminum sulfate) don’t go into action until they’re both wet AND hot…so you get more rise once in the oven. You may not get this with just plain baking soda since the bubbles might deflate after mixing the batter, but before getting the muffins into the hot oven. But unless you’re hosting Martha Stewart…you’re probably fine! Need I remind you that salt brings out the flavors of food? 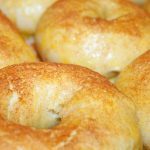 Seriously, if you haven’t done a side by side comparison of salted and unsalted foods…DO IT! 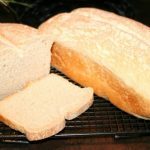 Just ask my family about the time I made sourdough bread and forgot the salt! Sooo not delicious! 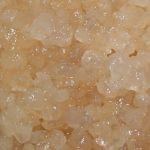 Just be sure to use a good quality sea salt, the added minerals are an extra bonus! And if you want to take these muffins over the top, give a sprinkling of course sea salt over the top before baking! WOAH MAMA! Because carrot cake and cinnamon go hand-in-hand! Plus there are some great blood-sugar stabilizing properties and other health benefits of cinnamon. You just can’t go wrong here. I will say this…if you’re stumbling on this recipe in the fall…swap out the cinnamon for pumpkin spice (and increase the amount to a tablespoon). We love it so much I actually mix up about a cup of homemade pumpkin spice at the beginning of fall and it lasts me all year! There’s something about using pureed fruits and veggies in baking that delivers moist muffins EVERY.SINGLE.TIME. Now ya’ll could get uber crunchy and roast, then puree your own pumpkin…but I’ll leave that up to you. The canned kind works just fine, too. But if you’re gonna go to the trouble of roasting your own, may as well make it roasted and pureed carrots to give these that extra bit of “carrot-y-ness”. Because of the high water content, ingredients like pureed pumpkin, bananas and applesauce are winners. Switch them up to your hearts content! See recipe alternatives in the recipe card. It’s “carrot” cake after all, right? Gotta have the carrots! These give the muffins an awesome texture, and add a bit more moisture to the end product. Eggs help keep these muffins fluffy, help with binding and definitely add a nice richness to the finished product. Depending on the size of your eggs, you may want to adjust this up or down. Because we get our eggs from a local farm, they often vary in size. I’d say they tend to be on the medium-small size, so if your eggs are large, then two eggs would suffice. You can sub chia or flax to make vegan eggs that work nicely with this recipe. Although the end result will be a bit more dense, not quite as fluffy, our main concern is flavor…and you’ll still have that in spades! CHIA EGG: 1 Tablespoon ground chia seeds + 3 Tablespoons room temperature water = 1 large egg. FLAX EGG: 1 Tablespoon ground flax seeds + 3 Tablespoons room temperature water = 1 large egg. A muffin made without fat just won’t taste as good…PERIOD! You can try to dissuade me on this fact, but it’s likely you’ll fail. Traditionally, I like to make muffins with pasture butter (and sometimes coconut oil), and would rarely recommend using a liquid oil when baking. There’s this thing about whipping the butter and sugar together at the beginning of a recipe that’s so nostalgic (not to mention it lends a light and fluffy final texture, especially in gluten-free baking) but we’re using avocado oil for this recipe. Why? Because I tried it on a whim one day when I was out of both butter and coconut oil and was SHOCKED how well it worked! And since this is my website, I get to make the rules! So avocado oil it is! One of the bonuses about using avocado oil over coconut oil is the ease. I don’t have to scoop out my solid coconut oil, melt it, THEN measure it before mixing it into the recipe. And since the avocado oil has a super mild flavor, it’s not overpowering in the slightest. I would NOT, however, recommend trying this with olive oil. Those flavors would likely come through! Rest easy, if you just can’t get on board with avocado oil, just use coconut oil or butter. I won’t balk! There’s this funny thing about baking…you can’t just sub ingredients left and right. Sure, sometimes you might have luck, but if you do this with regularity, then you might understand the science behind baking more than the average Joe. So, as tempting as it may be, for the sake of your sanity…stick with a granulated sugar for this recipe, NOT a liquid sweetener like maple syrup or honey. Because I do my best to be a sugar purist, trying to stick as close to unrefined as possible, we use maple sugar for this recipe (plus it just has such an awesome maple-y flavor!). The granulated sugar adds just enough sweetness and keeps the muffins nice and fluffy. If you must use a true, unrefined sugar, then just consider yourself warned, and don’t expect your muffins to be super fluffy. Heck, the taste will still be incredible, so again, unless you’re serving them to Martha Stewart, then do what you want! Preheat oven to 350 degrees F and line a muffin tin with 12 muffin liners. Measure flour, protein powder, baking powder, salt and cinnamon into the bowl of your stand mixer. Give it a quick whisk until ingredients are combined. Add pumpkin puree, carrots and eggs and whisk to incorporate. Add oil and sugar and mix until smooth. Distribute batter evenly between the 12 muffin cups (about 1/4 cup batter per muffin). Sprinkle with crushed walnuts and optional chocolate chips over each muffin. Bake at 350 degrees F for 20-25 minutes, or until toothpick inserted into the center comes out clean. 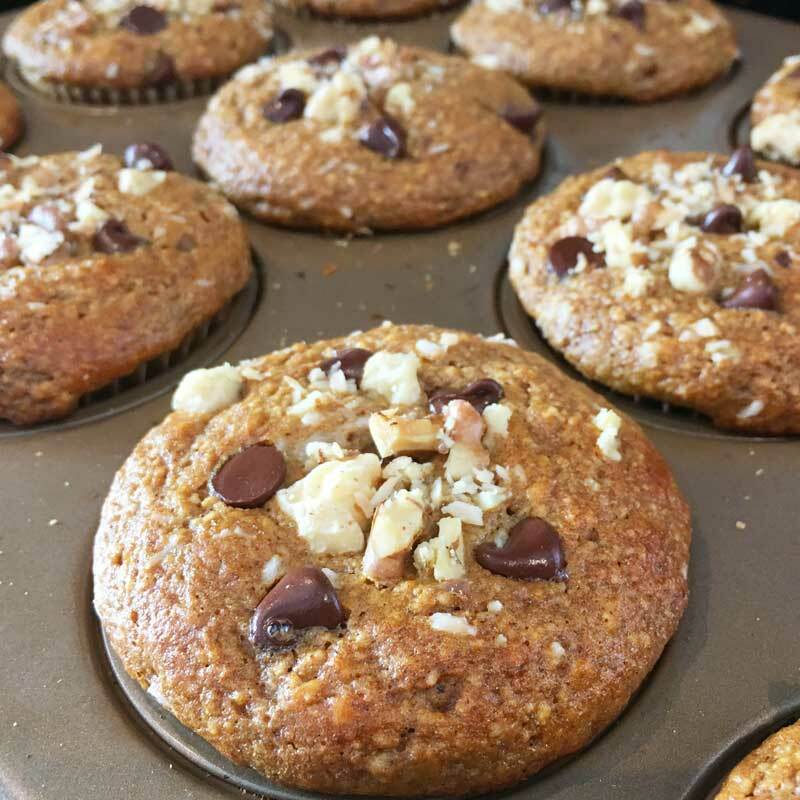 Make GF Paleo Protein Pumpkin Muffins pumpkin pie spiceby omitting the carrots and lemon zest, increasing the pumpkin to 1 cup, adding 1 Tablespoon and topping with coconut, walnuts and chocolate chips. Swap out the pumpkin puree and carrots for applesauce and omit cinnamon, then add any additional mix-ins you’d like (see options below). GF, Paleo Blueberry Protein Muffins: Add 2 teaspoons vanilla extract to recipe and stir in 1 cup fresh or frozen blueberries just before baking. GF, Paleo, Lemon Poppyseed Protein Muffins: Add 2 teaspoons almond extract, 1 Tablespoon lemon zest and 1 Tablespoon poppyseeds to recipe. Most baking has a specific order when combining the ingredients. You just can’t go adding ingredients all willy-nilly and expect a quality end result. Sure, it might taste fine…but really, just stick to the recipe. Start by adding all the dry ingredients into your mixing bowl. Grab a whisk and give it a good stir to combine. This prevents getting clumps of baking powder or a big bite that has no spices in it because you didn’t mix the dry ingredients first. Next, the wet players come into action…these we’ll incorporate after each addition, just to be sure we’re getting a solid mix. Now don’t go hog wild here, you’re just wanting to mix just until everything is incorporated. There’s a little wiggle room here, so if you’d rather add the pumpkin, carrot, eggs, oil and sugar all at once then mix, by all means, don’t let science stop you! But lemme explain why the recipe is written as such…normal muffins that are made with butter, start by mixing the sugar into the butter and letting it get nice and fluffy. But since we’re not doing that, we’re just adding it in at the end with the oil. For these gluten free muffins, we added the oil after the eggs and pumpkin in hopes we could get a little more air into the mixture in the beginning stages. This is why I say, “don’t over-mix the batter”. M’kay? How do you like your muffins…clothed or in their birthday suit? I prefer pants on my muffin, so I always line the pan…it also makes cleanup a breeze. If there’s one thing I hate washing the most, it’s probably a dirty, baked on battered muffin tin. But I leave it up to you. If you keep your muffins au naturel, I HIGHLY suggest you generously grease your muffin tins. It may just be me, but I think gluten free products tend to stick worse than non!? Anyone else notice this? No one likes dry, crumbly muffins, so keep your filling evenly distributed between muffins. I like to use this handy dandy cookie scoop (I honestly can’t remember my life without this!). Two heaping scoops in each cup’ll do! The toppings in this recipe are purely optional. But I find that little added crunch from the walnuts is a nice touch. You could also go crazy and add some chocolate chips, because…well…CHOCOLATE! If you’re really trying to watch your sugar, you could always opt for these stevia sweetened dark chocolate chips (they’re amazing!). Everyone’s oven seems to have a mind of it’s own, and unless you’ve had yours calibrated lately, it’s likely it’s not actually cooking your food at the temperature you think it is. Just keep an eye on these guys and when they look set on top, stick a toothpick inside. If it comes out clean, they’re done! You can also test them by giving a good “tap” with your finger. If the tops are firm and set, it’s likely time to pull ’em out. If (and that’s a big IF) you can wait for your muffins to cool before eating, transfer them to a wire rack. 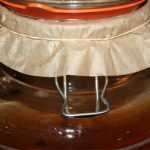 Once they’re cooled completely, you can store them in a zip-top bag (or on a plate covered in plastic wrap). These muffins need to be kept air-tight to keep them from drying out. Muffins have a tendency to do that! They should keep for about two-three days at room temperature, but they also freeze beautifully!